A good friend of mine and a regular reader of TexasBurgerGuy told me about Clay's. All he told me was that Clay's had a good burger. He didn't tell me anything else about it. 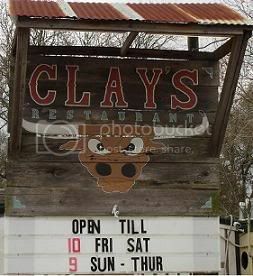 When we drove up to Clay's - my wife and especially my 3 year old daughter got VERY excited. 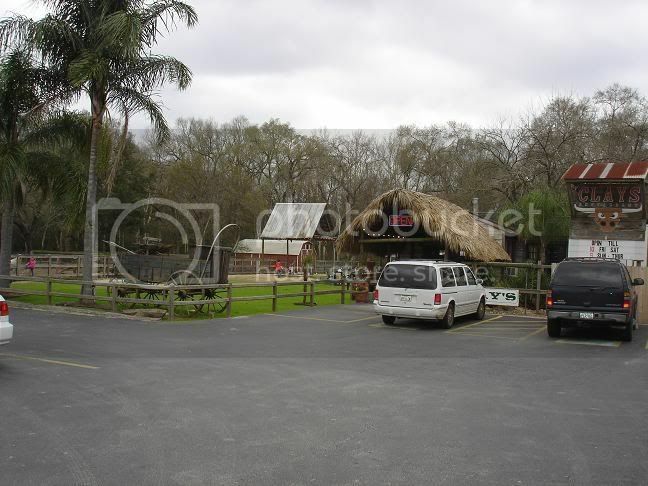 Reason was it looked liked we hadn't arrived at your typical burger joint.. no... it looked like we took a wrong turn and were at the Houston Zoo... or at least a petting zoo. Clay's is kid friendly to say the least. I'll talk more about this later. While being kid friendy was a big bonus in my book - what really mattered was if the burger was any good. 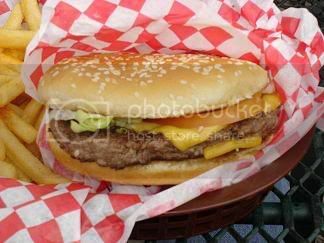 After receiving my burger - I discovered that not only does Clay's have a good atmosphere for families and kids, but they serve up a pretty good burger as well. As I walked to my table - I was trying to take a peek at the burgers that everybody else had ordered. What I saw was a pretty good looking burger. But - like I learned during my dating years - looks can be very deceiving. What matters is on the inside. After a short while - my cheeseburger was delivered to my table. I anxiously opened up the burger and peered inside. Again - everything looked OK but I just needed to get that first bite. Immediately after my first bite - I discovered that my burger was good - not perfect - but just a good burger. 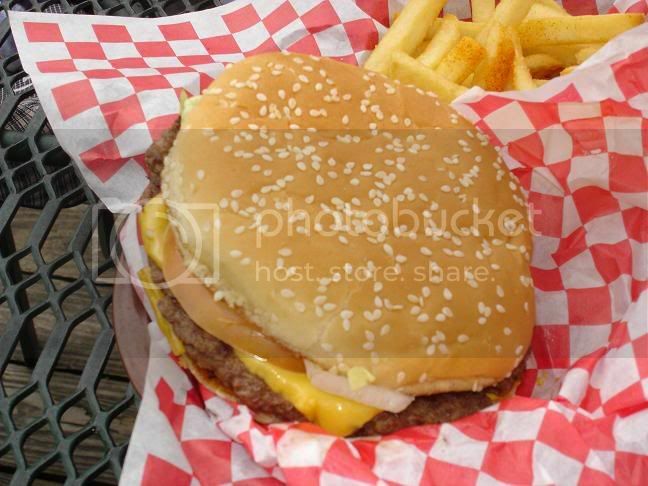 The Clay's Cheeseburger is by no means a drippy get-your-shirt-wet burger. It was not dry though - just not super ooozy. I was less than impressed with the vegetables on my burger. The tomato was not ripe. It kindof ruined the first bite actually. I pulled it off because I didn't want to ruin the rest of the burger. The lettuce was good though. Another complaint I had about the cheeseburger was they put too much mayo on the burger. It messed up the whole chemistry of the burger. The mayo overpowered the flavor of the meat, cheese, bun, etc. If that was a little more under control, it would have been a lot better. Overall - the oooze is lower on this burger - but still a tasty burger. The cheeseburger was 7 ounces which isn't huge. After eathing the burger - I wasn't completely stuffed or anything.. but I was full. The patty had a good beefy flavor. Not many seasonings applied to it and certainly no marinating had been done. Cheese did melt which is good in my book. Overall - not really big or really beefy - but good nonetheless. The Cheeseburger was a 1 1/2 handed burger. It was big - but not 2 handed stuff-is-falling-out size burger. Still a good sized burger though. 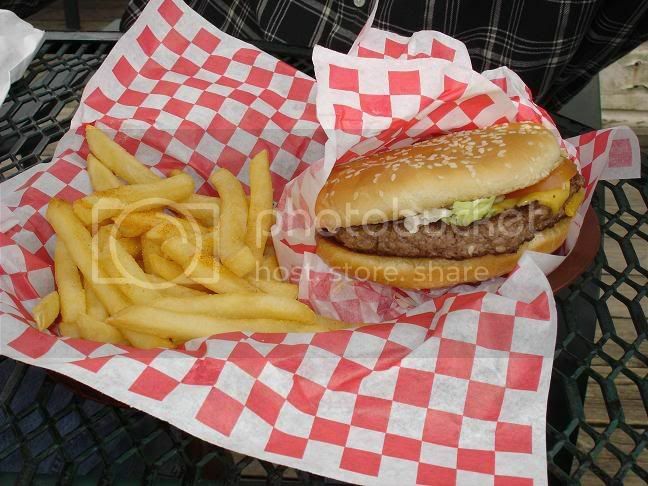 The cheeseburger basket that you see below was $5.79. In my opinion - that isn't too bad considering you get a 7 oz. burger and fries for that price. If it was 5.79 for the burger - this might be the first rating of 1 in the bling bling category ever. But - given that it was a burger and fries for that price - this gets much higher than a 1. For this trip - I took my wife, kids, and my mom. Since we had several people with us - we tried a lot of menu items. We tried the Grilled Chicken Hoagie, CC's Caeser Salad, kids grilled cheese, fries, and tots. Mrs TexasBurgerGuy loved the Grilled Chicken Hoagie. My mom wasn't overly impressed with the salad - but said it was OK. One of the coolest things Clay's did was bring my daughter's grilled cheese out well before our food was brought to us so we could get her started on her meal. Great idea!!! Very friendly waitstaff. I had heard good things about the Queso Burger but decided to stick with the tried and true Cheeseburger. Next time we go back - I'll have to try the Queso Burger. 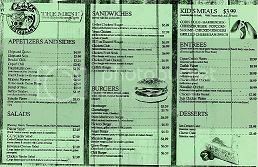 Overall - good standard menu. Not set-you-on-fire GREAT food - but good enough. Clay's is VERY kid friendly. 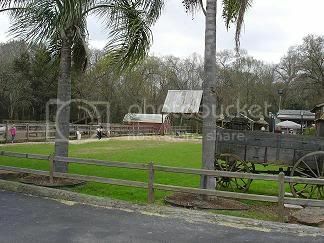 They have several horses that will let you feed them if you want. I actually got to help my daughter feed her first horse which was very cool for me. Then we got to pet some sheep, goats, and even a miniature horse. They also have emus which I wouldn't recommend feeding or doing anything with actually. They are not pretty animals. In addition to all of the animals - they have a huge sandbox that all the kids can play in. My daughter really enjoyed that as well. There are tables outside on a deck so you can watch all the kids playing while you eat. Clay's also has a party room that is available at no charge for the facilities. You just need to reserve it in advance. My wife was so impressed with the kid friendliness of Clay's that we went ahead and setup my daughter's birthday party at Clay's. Overall - Clay's has a great atmosphere. Kid friendly. VERY clean. Very neat. If you are on the West side of Houston - make your way on over to Clay's. Overall Clay's is a great place to take the family for a Saturday afternoon lunch. You can kick back on the deck, enjoy some good food, and let the kids pet the animals. While the Clay's Cheeseburger at Clay's was good - it didn't blow my socks off. The rest of the food we tried was good too - but not great. 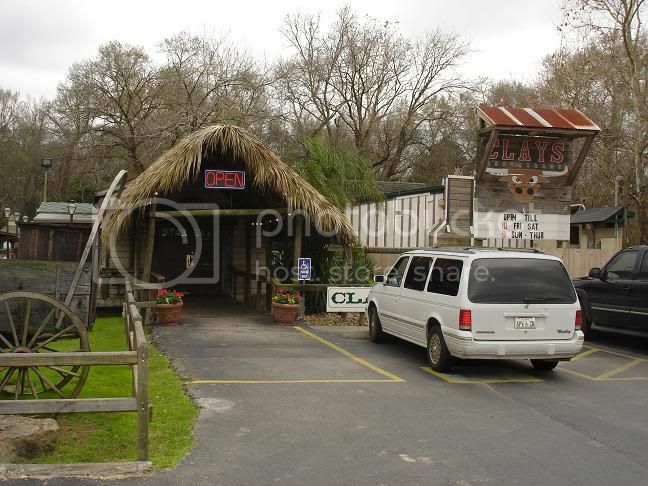 BUT - when you factor in the overall experience - Clay's is a place that I would go back to again and again. I go to school at DeVry University which is right next to Clay and I was looking for a place to eat before I went to school and saw Clay's Restaurant after I had settled for Subway and it looked so unique to me that I went home and Googled it, and low and behold, your website came up, which I am a fan of by the way. I had totally forgotten that you had reviewed Clay's and after re-reading the review, I will definitely be checking it out soon. 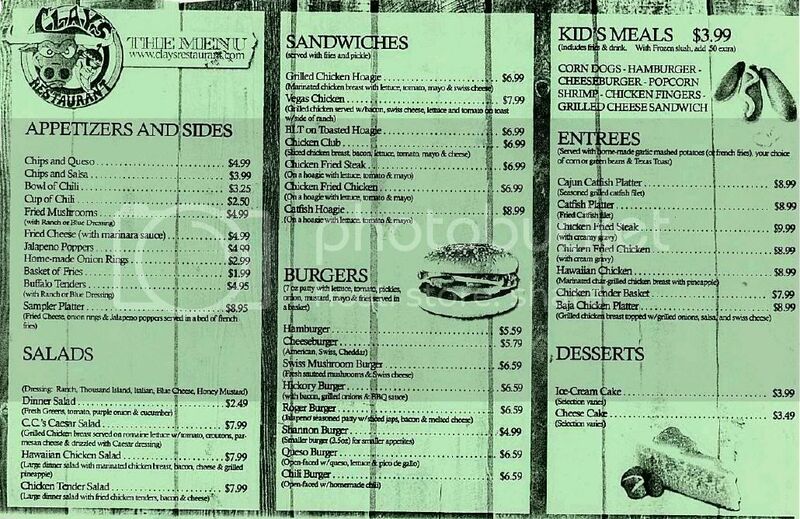 I also pass Aunt Pookie's BBQ & Burgers everytime I go to school so I'll be stopping there soon too. Love the site. Keep it up! I agree the burgers are decent but the service is awful. My freind wanted to have her Birthday party there and so we did. The staff was so rude. I mean I was astonished at how they not only spoke to us but treated us overall. I will never go back there. The food was not good enough to deal with that kind of service. Your blog is a nice one though. Have a good one! My grandbaby loves petting the animals and the sandboxes. We can sit outside and eat, and he can play in the sand nearby and pet the horses and goats. Then we can go back and watch the peacocks. It's a great place for families. 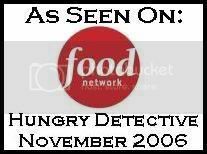 Funny part is my grandbaby's Dad ate there when he was little. It's been a familt tradition for us for a long time. Clay's is a great place to eat. I try to stop there every time I am in town to visit my parents. I recommend the Roger Burger. I have lived all over the country and nothing beats it. Clay's has changed quite a bit over the last year or two. They've expanded a lot since this post and added more thrills and really nice outdoor seating. Really, the main appeal for us is that it's really kid friendly and the adults can get some talk-time in while kiddos play. You really should try out the queso burger. You're right, their burgers are good but not totally spectacular, but the queso burger is pretty gooey and yummy.